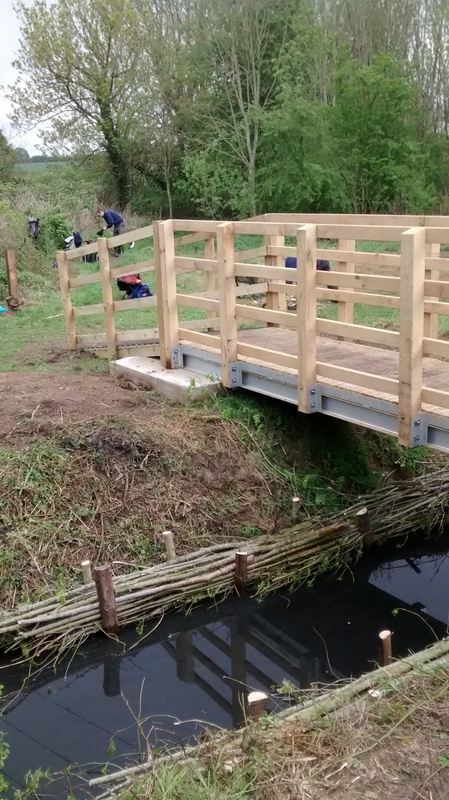 Last week the volunteers joined Bobbie and I to install faggots to protect the Eastern (6m) Bridge that we installed. The bundles of ash stems were fixed down with chestnut posts and tied in with wire. The faggots have already proved useful at reducing bank erosion from dogs, which if left unchecked, could undermine the concrete abutments. If you want to take a look it’s easiest to enter the reserve through the new kissing gate off Overton Close, then turn left before you cross over the Western Bridge. The path under the pylon ride will bring you out to the Eastern Bridge. A fun spot of aquatic engineering. This entry was posted in River, Tice's Meadow, Volunteers and tagged Blackwater River, Bridge, Tuesday Volunteers, Volunteers. Bookmark the permalink.